The Club was formed as a 9 hole course in 1894 by local landowner Mr H W Lawrence who invited members of the public to become members. In December that year the Bath Chronicle reported on a meeting held at the Castle Hotel Chaired by Mr H W Lawrence when it was agreed for a Mr Forbes to be Secretary and the Reverends C W Shickle, W E Blathwayt, and Messrs F E Rogers , T F Inman, H G Sheldon as Committee members. Lord Weymouth was also invited to be President and Mr Lawrence as Vice President. 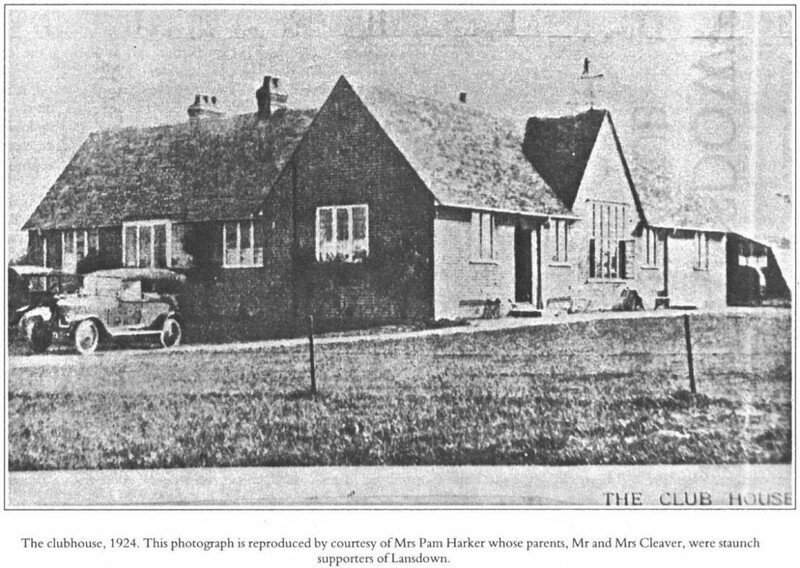 The idea of a clubhouse could not be entertained at this meeting however as Mr Lawrence had a couple of cottages near the first tee as one of them would be used as a clubhouse. There was also accommodation for members’ horses and carriages. In 1906 additional land was obtained and the course was extended to 18 holes to make it one of the best inland courses in the West of England. 1908 Sir Alexander Waldemar Lawrence succeeded his father as Club President. In 1909 the Committee somewhat reluctantly decided to give up the picturesque old cottage clubhouse and build a new one in a more accessible place where the current clubhouse now stands. By the mid-twenties the Club membership stood at 218 of which 163 were Gentlemen and 55 were Ladies. In May 1971 what was thought to be the first complete course watering system in the West Country was officially switched on switched by Club Captain Len Taylor. Picture. The Lawrence family name and Lansdown have been synonymous since golf was played at the famous golf links through from Mr H W Lawrence to the current Club President Sir Henry Lawrence.